Whether installing new cables, taking care of a noisy chain or performing a full bike overhaul, you'll need some lube. Bike lubricants not only keep everything running smoothly, but also help repel the dirt and moisture that can wear out your components. For the best bike lube, the product needs to match the repair you're doing and the conditions you ride in. 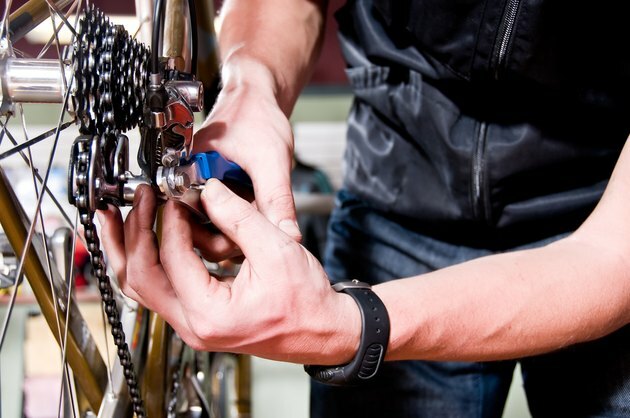 Because you should lube it once a month, your chain will be the part of your bike you lube most frequently. Chain lube not only keeps the chain traveling over your gears well, but also protects your chain from gunk. The best lube depends on your riding conditions. If you're a commuter or mountain biker who may encounter rain, puddles and mud, a wet lube is the best choice. If you're a cyclist who rides mainly in dry conditions, choose a dry lube. Wet lubes adhere to the chain better and provide more protection from corrosion than dry lubes. Dry lubes, due to their alcohol base, aren't sticky and keep dry dust and dirt off the chain better than wet lubes that have a tendency to attract dust. Bike grease is a type of lube used in small quantities when doing repairs such as replacing brake or gear cables. Bike grease is a medium-weight grease that resembles petroleum jelly. If you can't find bike grease, you can use white lithium grease instead. This grease is used on car parts and is often less expensive than true bike grease. Do not use automotive bearing grease; it is sticky and can gunk up your components. You'll also use bike grease on pedal threads when installing new pedals, on ball bearings when overhauling a bottom bracket and on the stem or seatpost when inserting them into the frame. Bike oil is a medium-weight oil used most often on the pivot points on your bike. This includes the derailleur pulleys, forks with suspension and calipers of your brakes. When replacing a cassette, you'll need to apply oil to the bearings within the cassette. Although, you shouldn't use oil as a chain lube if you have a pin in one of the links that isn't moving freely. Oiling the pin can help you avoid the stutter of a stiff chain. Oil is typically used in small quantities, but if you have a three-speed bike with internal gears, the internal hub needs to be oiled liberally when it is serviced. Some items may seem like good substitutes for lube, but will only cause you headaches. Motor oil should not be substituted for bike oil or chain lube because the particulate matter in it and its acidity can wear away your components. Petroleum jelly may look like a good substitute for bike grease but it is not durable enough to withstand the rigors you put your bike through and will quickly disappear, especially in wet conditions. WD-40 is not a replacement for chain lube because it is not a lubricant. The solvents within WD-40 will actually push lube out of your chain, causing the links to rub together and wear out.